In July 2010, The Hat Ladies were volunteers at The Women and Girls Summit, created and hosted by Tammy McCottrey Brown, star of the Talk Show that bears her name. One of the guest speakers was Simona-Mirela Miculescu, Ambassador Extraordinary and Plenipotentiary Permanent Representative of Romania to the United Nations. The idea of THE HATS OF THE WORLD LUNCHEON was born that weekend and became a reality on January 20, 2011. Accordingly, our respective Ladies assembled in the City of New York at the Romanian Mission on January 20, 2011, combined fashion with compassion, and proved with a hat on one’s head and a smile on one’s face, the world becomes a better place. 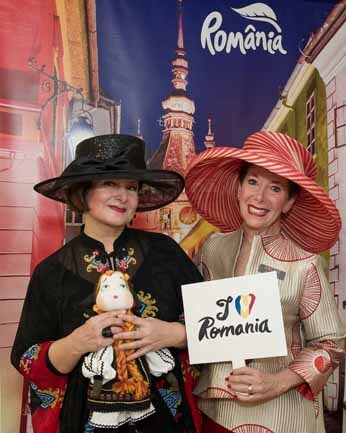 The first three Hats of The World Luncheons remained at the Romanian Mission, with Ambassador Simona Miculescu as the co host.. In 2014, the hat was passed to Ambassador Isabelle Pico of Monaco.